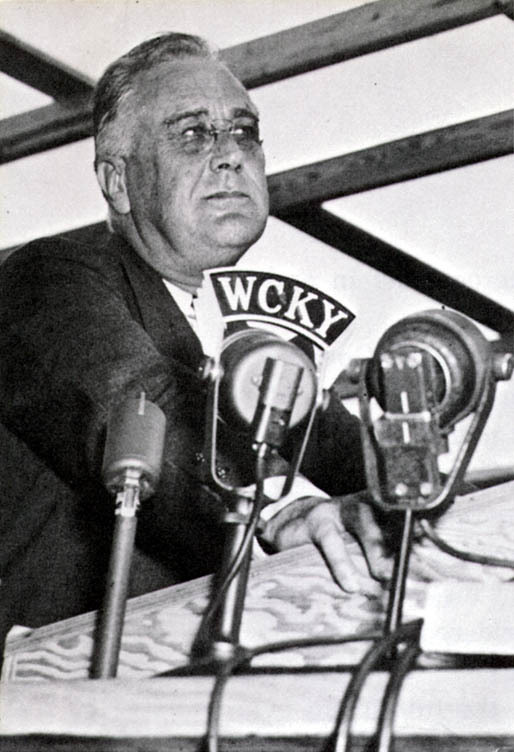 On July 2, 1932, on accepting the nomination as Democratic Presidential candidate, FDR made his famous promise of a "New Deal" for the American people. This policy was intended to make a drastic shift in the American society, which becomes clear, when we hear FDR himself. "Let us . . . highly resolve to resume the country's interrupted march along the path of real progress, of real justice, of real equality for all of our citizens, great and small. . . . There are two ways of viewing the government's duty in matters affecting economic and social life. The first sees to it that a favored few are helped, and hopes that some of their prosperity will leak through . . . to labor, to the farmer, to the small businessman. That theory belongs to the party of Toryism. . . . But it is not, and never will be the theory of the Democratic Party. "The people of this country want a genuine choice this year; not a choice between two names for the same reactionary doctrine. . . . What do the people of America want more than anything else? Two things: Work; work, with all the moral and spiritual values that go with work. And with work, a reasonable measure of security--security for themselves, and for their wives and children. Work and security . . . are the spiritual values, the true goal toward which our efforts of reconstruction should lead.Throughout the nation, men and women, forgotten in the political philosophy of the government of the last years, look to us here for guidance and for more equitable opportunity to share in the distribution of national wealth. . . . Those millions cannot and shall not hope in vain. I pledge to you, I pledge to myself, to a New Deal for the American people. This is more than a political campaign, it is a call to arms. Give me your help, not to win votes alone, but to win in this crusade to restore America to its own people"
Agricultural Adjustment Agency (AAA) Created in 1933 to bring farmers' share of nation's income back to level of 1909-14. Sought to provide an "ever-normal granary." Declared unconstitutional in 1936. Most of its duties taken over by Soil Conservation and Domestic Allotment Act. Reconstituted in 1938. Central Statistical Board (CSB). Created in 1933 to coordinate federal and other statistical services. Duties absorbed by Budget Bureau in 1939. Civil Aeronautics Board (CAB). Created in 1940 to regulate economic aspects of United States air carriers; to help establish foreign air routes and services; to investigate civil air accidents. Succeeds the Civil Aeronautics Authority (1938). Civilian Conservation Corps (CCC) Created in 1933 to succeed the agency known as Emergency Conservation Work; to provide employment and vocational training for needy young men through work in the conservation and development of natural resources. In Federal Security Agency until abolished in 1942. Commodity Credit Corporation (CCC). Created in 1933 to make loans to producers to finance the carrying and marketing of agricultural commodities. Transferred to Department of Agriculture in 1939. Electric Home and Farm Authority (EHFA). Created in 1935 to finance consumer purchases of electrical equipment in homes and on farms. Became part of Federal Loan Agency in 1939. Transferred functions to Department of Commerce in 1942; abolished the same year. Farm Credit Administration (FCA). Created in 1933 to make long-term and short-term credit available to farmers and to farmers' cooperative marketing and purchasing organizations; assumed duties of Federal Farm Board (established in 1929). Farm Security Administration (FSA). Created in 1937 to aid tenant farmers and to carry on rehabilitation work of Resettlement Administration. Federal Alcohol Administration (FAA). Created in 1935 to administer the federal liquor laws. Duties absorbed by Bureau of Internal Revenue in 1940. Federal Communications Commission (FCC). Created in 1934 to regulate interstate and foreign communication by telegraph, telephone, cable, and radio. Federal Crop Insurance Corporation (FCIC). Created in 1938 to insure wheat producers against loss due to unavoidable causes and extended to growers of other crops. In Department of Agriculture. Federal Deposit Insurance Corporation (FDIC) Created under the authority of the Federal Reserve Act of 1933 to insure the deposits of approved banks against loss in the event of bank failure. Federal Emergency Administration of Public Works (better known as Public Works Administration) (PWA) Created in 1933 to reduce unemployment and to restore purchasing power through construction and long-range planning of public works. Absorbed by FWA in 1943. Federal Emergency Relief Administration (FERA). Created in 1933 to relieve the hardships caused by unemployment and drought. Abolished in 1938, and its work carried on by WPA until 1942. Federal Housing Administration (FHA). Created in 1934 to encourage residential construction, repair, and modernization by insuring loans and mortgages. Federal Loan Agency (FLA). Created in 1939 to direct all agencies lending federal funds, except those making agricultural loans. Federal Security Agency (FSA). Created in 1939 to direct all agencies concerned with social and economic security, educational opportunity, and national health; included Office of Education, Public Health Service, Food and Drug Administration, Children's Bureau, and Office of Vocational Rehabilitation. Federal Surplus Commodities Corporation (FSCC). Created in 1935 to distribute surplus farm products to state relief agencies for the use of the needy. Merged into Agricultural Marketing Administration in 1942. Federal Works Agency (FWA). Created in 1939 to coordinate all public construction. Home Owners' Loan Corporation (HOLC). Created in 1933 to grant long- term mortgage loans on homes. Maritime Labor Board (MLB). Created in 1938 to improve labor relations among seamen. Expired in 1942. National Emergency Council (NEC). Created in 1933 to coordinate the work of the federal agencies. Abolished in 1939, and functions transferred to Executive Office of the President. National Housing Agency (NHA). Created in 1942 to consolidate all housing activities. National Labor Relations Board (NLRB). Created in 1935 to protect employees in their rights to self-organization and collective bargaining. National Recovery Administration (NRA) Created in 1933 to draw up trade codes of fair competition. Declared unconstitutional in 1935. National Resources Planning Board (NRPB). Created in 1939 to advise president on development of national resources; cooperated with state and regional planning boards. Abolished in 1943. National Youth Administration (NYA). Created in 1935 to furnish part- time employment for needy high-school and college students; to provide part-time employment on work projects for out-of-school youth; to provide vocational guidance. Transferred to Federal Security Agency in 1939. Abolished in 1943. Resettlement Administration (RA). Created in 1935 to administer rehabilitation and resettlement projects for the relief of farm areas. Abolished in 1937, and remainder of program completed by Farm Security Administration. Rural Electrification Administration (REA). Created in 1935 to introduce electric service into rural areas not already served. Transferred to Department of Agriculture in in 1939. Securities and Exchange Commission (SEC) Created in 1934 to license and regulate stock exchanges and to control public utility holding companies. Social Security Board (SSB). Created in 1935 to administer the federal old-age retirement funds. Surplus Marketing Administration (SMA). Created in 1940 by merging FSCC and Division of Marketing and Marketing Agreements. In 1942 merged in Agricultural Marketing Administration. Tennessee Valley Authority (TVA) Created in 1933 to operate government- owned properties at Muscle Shoals, Ala.; to develop water and power resources of the Tennessee River watershed; to plan for the social and economic well-being of the valley. United States Maritime Commission (USMC). Created in 1936 to develop a merchant marine to carry the domestic and foreign waterborne commerce of the United States on ships built, owned, and operated by United States citizens; succeeded United States Shipping Board and Merchant Fleet Corporation. Works Progress Administration (WPA) Created in 1935 to relieve unemployment; later called Work Projects Administration. Abolished in 1942.